Professors love to hate grade inflation, saying course marks aren’t as meaningful as they used to be. A new paper makes the case that easy grading is actually a symptom of poor assessment practices rather than a cause and that, either way, reducing leniency in grading may lead to more accurate assessment. 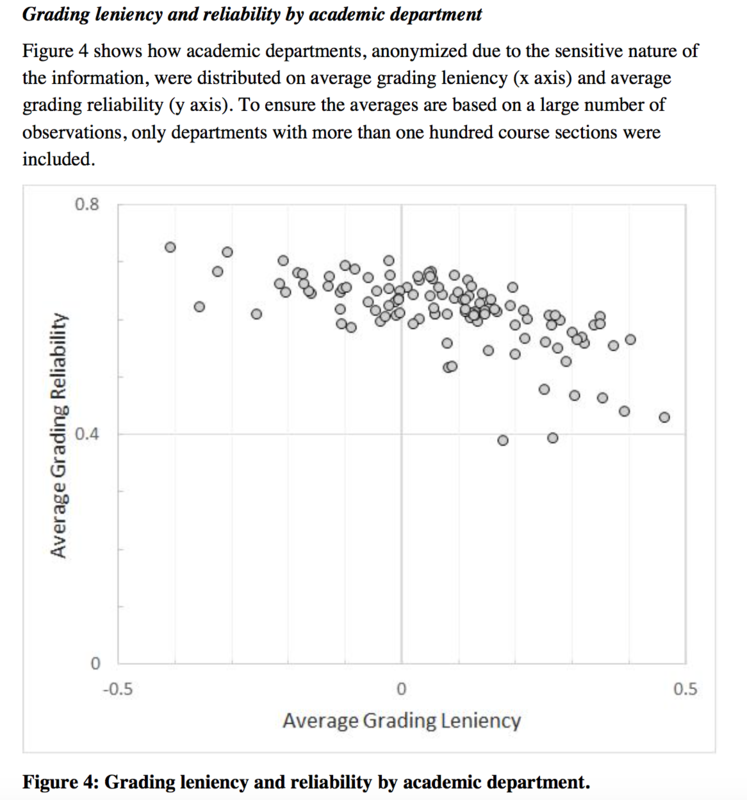 “The Relationship Between Grading Leniency and Grading Reliability” is based on a data set pertaining to 53,460 courses taught at one unnamed North American university over several years. All sections included 15 or more students with passing grades, and failing grades were tossed out of the analysis to avoid any biasing effect on average grades. The primary focus was whether grades were reliable measures and whether they were lenient. Results suggest they're often neither, though there was plenty of consistent grading. A leniency score was computed for each section as the “grade lift metric,” or the difference between the average grade a class earned and the average grade point average of the class’s students at the end of the semester. So if a course section’s average grade was B, but the students’ average GPA was 3.5, then the “lift” score was -0.5, indicating tough grading. A positive score indicated lenient grading. “The core idea is that high grading reliability within a department should result in course grades that correlate highly with each student’s GPA,” reads the study, written by Ido Millet, a professor of business at Pennsylvania State University at Erie. Course section grading reliability scores were computed based on the same logic. So, in an extreme example, a section in which high-GPA students received low grades and low-GPA students received high grades earned a low reliability score. Grading reliability averaged 0.62, meaning that in most cases better students received better grades. Millet also compared grading reliability in sections with lenient grading (positive grade lift) with sections with tough grading (negative or no grade lift). Data indicated that reliability for tough graders was higher. To isolate the effect of factors other than leniency on grading reliability, Millet included several independent variables in the analysis: standard deviation of GPA within each course section, class size, instructor experience, course level and number of credits. Reliability positively correlated with the standard deviation of GPA within each course section, and with and course credits -- probably because a four-credit course provides more opportunities for student-professor interaction. There was a low and negative correlation between instructor experience and grading reliability, and classes with more students had higher reliability. There was lower reliability in upper-level courses, probably because of the relative homogeneity of students. 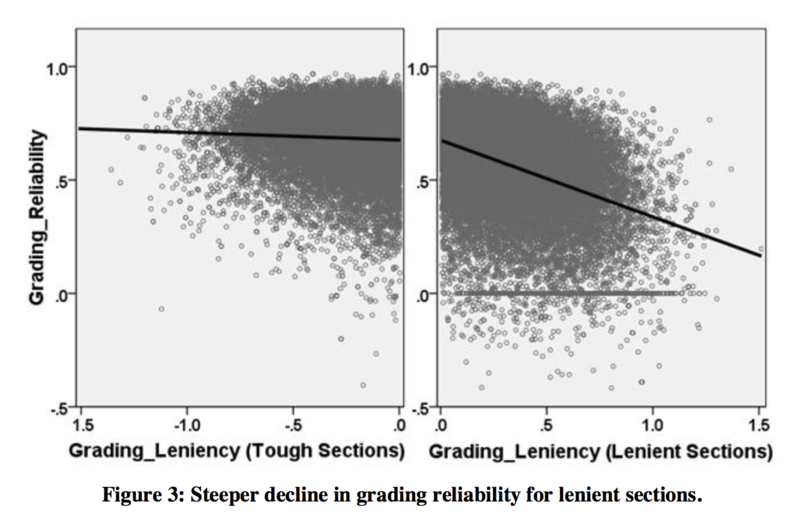 But even after accounting for the effects of other variables, grading leniency still had a significant negative association with grading reliability, according to the study. Similar to results for individual course sections, the decline in grading reliability was more pronounced among departments with lenient grading (departments were anonymized in the study). The study notes several limitations, including that GPA is only a “proxy” for expected performance and that replications using data from other institutions are needed. Yet Millet argues it has several important implications for higher education, such as that future studies of grading reliability should incorporate measurements of variability in students’ abilities, and that grading reliability should be incorporated as an independent variable when higher grades lead to higher scores on student evaluations of teaching. Millet has previously suggested  that giving instructors information about how lenient their grading is compared to their peers’ can significantly reduce variability in grading leniency, and he says that future research may extend the same approach, to see whether this also leads to increased grading reliability.